← With only eight days till Christmas . . .
With approximately seven minutes to go before my beloved Xavier Musketeers take on Duke, I decide to click on ESPN.com (beta!). Big mistake. They’re highlighting what promises to be a great Saturday of college hoops, with stories and pictures from UConn, Gonzaga, Purdue, and, of course, Duke. Missing from this list is Duke’s OPPONENT, even though XU is currently ranked seventh in the country, one spot behind the Blue Devils. 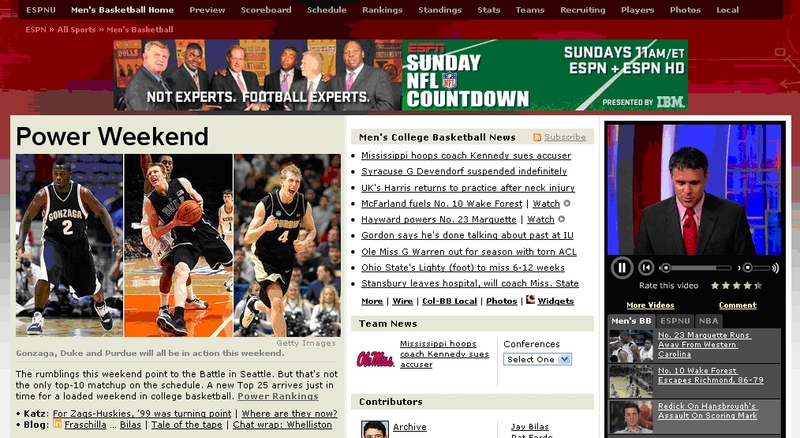 In fact, the only “Xavier” mentioned on ESPN’s front page is Xavier Henry, the top player in the 2009 recruiting class. At least I don’t have to worry about hearing Clark Kellogg call them “EGGSavier.” I hope. UPDATE: Egads. Also, this year’s Duke squad might be their most annoying since J.J. Redick: The Early Years. Can we bring back The Landlord?